Last season was one of the must frustrating in Jim Boeheim’s tenure at Syracuse. A group plagued by inconsistency, the 2016-2017 Syracuse basketball team was capable of impressive offensive outbursts, but was all too frequently lousy on defense. 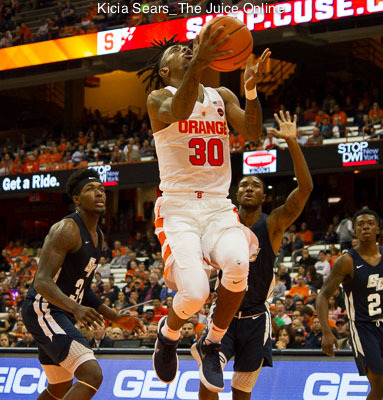 As a result, the squad was erratic, logging upset wins over Florida State, Virginia, and Duke, but also suffering eight double-digit losses, including a 33-point blowout by St. John’s at home and a 15-point loss at Boston College where SU never led. The team ended the campaign with a less-than-impressive 19-15 record. Some of the high points were exhilarating. Both John Gillon and Andrew White III scored at least 40 points in a single game, both in victories. Gillon hit a dramatic buzzer-beating three-pointer in the Duke upset and Tyus Battle did the same to down Clemson. White III claimed the school record for threes in a season. On the other side of the coin, Battle missed time with both a foot injury and an illness, Tyler Lydon often appeared frustrated on the court, and Frank Howard suffered through four torn abdominal muscles in January. That injury was was never mentioned during the season, as Howard tried to gut it out, but he required surgery in May. When March rolled around, a group that started the season ranked in the top 20 dropped four of its final six regular season games followed by a loss to Miami in the ACC Tournament. A few days later, Boeheim looked completely spent addressing the media after the Orange failed to make the NCAA Tournament. Sentenced to the NIT, SU cruised through a weather-delayed first round game, rolling up 90 points on UNC-Greensboro, then was barely a speed bump, giving up 15 threes and 85 points in a season-ending loss to Mississippi. What was not known at the time of that season-ending loss was Mike Hopkins, who had been named Syracuse’s “coach-in-waiting” nearly a decade earlier, had decided to accept the head coaching job at Washington the previous day. That move led to Boeheim extending his contract at SU and later hiring former player Allen Griffin to fill in the assistant coaching vacancy. After Hopkins left, so did over half the scholarship roster. Most of those changes were expected, though, as Gillon and White III only had one season at Syracuse as graduate transfers. DaJuan Coleman and Tyler Roberson, whose senior seasons were frustrating for different reasons, also wrapped up their eligibility. Two surprises of varying degrees also came. Lydon declared for the NBA draft. 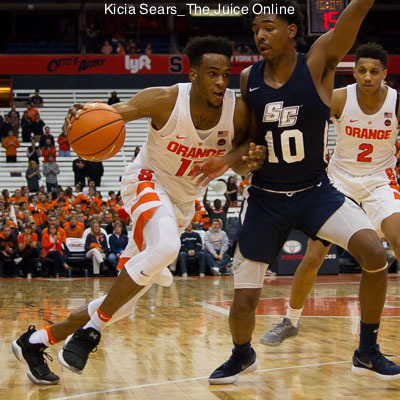 And, despite neither school confirming he has been released from his scholarship at Syracuse, Taurean Thompson is enrolled at Seton Hall and practicing with their basketball team. As a result, the 2017-2018 roster is short on experience and long on new faces. Junior guard Frank Howard is the longest-tenured SU player and sophomore guard Tyus Battle is the most accomplished. Beyond those two, the list of returning scholarship players features 108 minutes played at Syracuse, all those in the form of redshirt junior center Paschal Chukwu. Chukwu, who also logged 335 minutes at Providence as a freshman, had his Orange debut stopped abruptly after seven games by an eye injury that required surgery. Redshirt freshman forward Matthew Moyer is the only other returning player from last season, but he sat out his first season at SU. All four of those players figure to open the season as starters. Four freshmen join the Syracuse program, bringing a decided international flair. Oshae Brissett, who headlines the quartet, was the Canadian High School Player of the Year last season and opened eyes in the preseason. Bourama Sidibe was a 1,000-point scorer at traditional power St. Benedict’s in New Jersey, which rolled up a 65-6 record in his final two seasons. Howard Washington averaged just under 18 points and ten assists per game as a senior for Athlete Institute Prep in Ontario, Canada. Marek Dolezaj comes to the Orange from Slovakia, where he has represented his country on four different international teams, including finishing fourth in scoring in the 2017 FIBA Under-20 World Cup European Pre-Qualifier this past summer. As he did last year, Jim Boeheim brought in a graduate transfer to help shoulder the offensive load. In this case, Geno Thorpe will suit up for Syracuse after spending two years at Penn State and one at South Florida. More a combo guard than a true point, Thorpe amassed 822 points in his three seasons of play at those two stops. 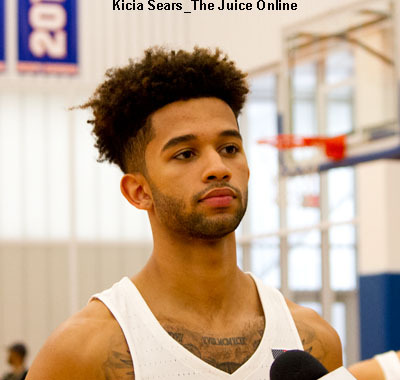 A second transfer joined the Orange in the offseason, as well, in East Carolina transfer Elijah Hughes. A 6’6” guard from Beacon, New York, Hughes, who averaged 7.8 points per game as a freshman for the Pirates, including nine double-digit scoring efforts, will sit out this season and have three years of eligibility remaining at SU. Not much is expected from this cast of mostly unknowns, as they were voted tenth in the ACC media poll prior to the start of the season and no player earned a spot on the conference’s first or second team. The primary question is if this young roster can grow together.